Six people just survived the sinking of an ocean vessel. Afloat in a lifeboat with only enough water for five are a doctor, a carpenter, a nurse, a blind elderly woman, a sailor, and a counselor. Public school students given this scenario over the years were then asked, "Who should be thrown overboard?" Such scenarios are presented to "soften up" young people toward doing the greatest good for the greatest number of people, even by the killing of the innocent through aborting children and euthanizing others. Tragically, the exercise encourages students to solve problems by eliminating excess people. Jacques Cousteau said, "to stabilize the world population we must eliminate 350,000 people per day. It is a horrible thing to say," he admitted, "but it’s just as bad not to say it." Such Hitlerian sentiments, as this one published in UNESCO Courier in November 1991, are not rare among those who also advocate the dismembering of children in the womb. Britain’s Prince Philip, president of the Worldwide Fund for Nature, once said that he would like to be reincarnated as a "killer virus to lower human population levels." Prince HIVlip, perhaps? How does anyone know there is only enough water for five? Utterly discredited, yet an authority to liberals, is Population Bomb author Paul Ehrlich, who has apparently not had a single prediction come true. America, he declared: would have widespread food rationing by the late 70s, would be "literally dying of thirst" by 1984, and would have 65 million famine deaths in the 80s. Interviewer: What is Somalia’s population? Interviewer: I’m not asking for an exact number, just to the nearest million. Interviewer: Well, then, if they are over populated, what is their population density per square mile? Countries with lower population densities generally have lower standards of living. Notice the scarcity of human beings in the poor nations. Whereas some of the most beautiful places on earth, and certainly the most prosperous and desirable, have tremendously dense populations. Naples, Italy has 48,032 people per square mile and Madrid, Spain has 68,385 ppsm! In the Far East, Japan, at 830 people per square mile, has a much higher standard of living than countries liberals argue are over-populated such as China, at 315 and India at 700. Taiwan has one of the highest standards of living in the East, with 1,503 people per square mile, with five times the density as those of much lower prosperity on the mainland. People are assets, not liabilities. Socialists and communists, however, since they must provide for so many helpless dependents, see people as consumers, rather than the producers most are. A few hundred years ago, famine was rampant in North America. Today, with a nearly thousand-fold increase in population, America not only feeds ourselves but we help to feed much of the world. Lord Peter Bauer of the London School of Economics pointed to the absurdity behind the notion that the instant a calf is born in a country, national wealth is said to drop. In 2011, if the world’s six-billion-plus people went to Colorado for a day, they could fit easily into one speck on the map of Colorado, the 404 square miles of Rocky Mountain National Park. We would not have to squeeze together like sardines, but could fit comfortably. If the world’s population doubled we would spill over into the nearest town. The sky is falling only in the pro-abortion, chicken-little minds of the over-population purveyor. Rather than a full house or a crowded lifeboat, an orbiting alien would view our world as nearly empty, as airline passengers can attest. Paul Ehrlich publicly bet a conservative economist that during the 1980s, natural resources would grow more scarce. Ehrlich chose five minerals to monitor. In 1990, losing the bet, Ehrlich made his wife sign the check, which amounted to over $500. The resources he was sure would become more scarce and therefore more expensive, in reality sold at reduced prices due to their greater availability world-wide. The Agricultural Economic Institute at Oxford University has estimated that, with current technology, the world could feed 100 billion people, while it is home to less than one-tenth that number. Progress in agri- and aqua-culture make it impossible to determine the upper limit of our future food supply. Who do you throw overboard? The sailor, the doctor, the nurse? "No, the old woman is already in bad shape," countless students have decided, "it’s her time to go anyway." And by giving out their annual Margaret Sanger Award, Planned Parenthood’s still celebrates their founder. 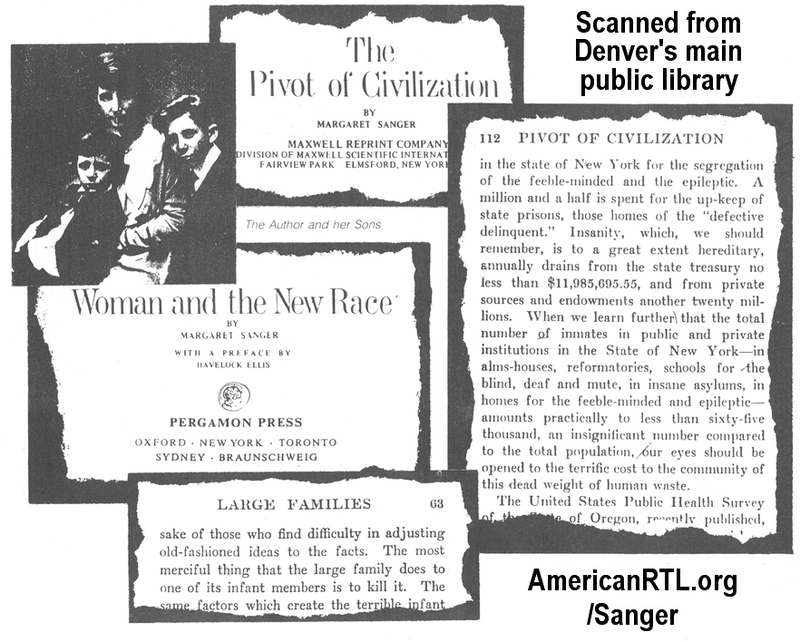 The Handicapped are Human Waste: Margaret Sanger wrote that the handicapped, including the "blind, deaf, dumb, mute and epileptics," were the "dead weight of human waste" in her book Pivot of Civilization. See this quote in context online at Google Books on page 112. 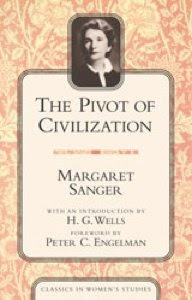 Kill Babies Even After They are Born: Planned Parenthood still says that they are Proud of our Past, even though Sanger, their longtime president, wrote on page 63 of her book Woman and the New Race, "The most merciful thing that the large family does to one of its infant members is to kill it." Historically, the over-population myth encouraged the brutal slaughter of the French Revolution. Greek philosophers feared the overcrowding of their ancient world. And even further back in time, the Babylonian and Assyrian accounts of the great flood held that, "the gods led by Enlil, agreed to cleanse the earth of an over-populated humanity." Those who want ultimate control over others have long wielded the over-population myth. Yet 2,800 years ago wise Solomon knew that, "In the multitude of people is the king’s honor, but in the lack of people is the destruction of the prince" (Proverbs 14:28). Please see also our Exceptions page, and you're invited to watch online Focus on the Strategy II (or via DVD). And remember, we are the makers of the world's largest protest sign against Barack Obama and the Democrats for destroying unborn children. Finally, if you'd like a 40-year pro-life education in 40 days, in less than one hour per day, then American Right To Life will keep track of your progress! To begin, just click on Get a 40-Year RTL Education!